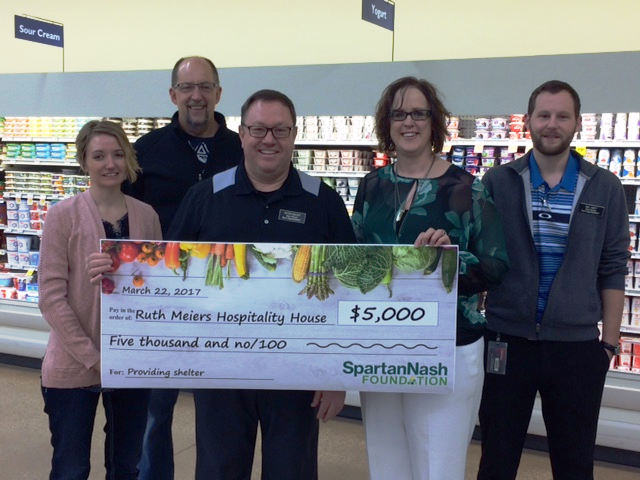 GRAND RAPIDS, Mich. – The SpartanNash Foundation recently presented a $5,000 grant to Ruth Meiers Hospitality House of Bismarck. The donation – which took place on March 22 at the Dan’s Supermarket-North located at 2101 N. 11th St. in Bismarck – will provide daily meals at Luke’s Kitchen, as well as access to laundry facilities, showers, computers and case management services to the homeless and those at risk of homelessness in the community. From left: Carrie Davis, Ruth Meiers Hospitality House manager of revenue, development and strategy; Loren Olson, Dan’s Supermarket-South store director; Pete Bauer, Dan’s Supermarket-North store director; Jaclyn Hall, Ruth Meiers Hospitality House executive director; and Neil Heidt, Dan’s Supermarket-Sunrise store director. Ruth Meiers Hospitality House was founded in 2987 and serves the greater Bismarck-Mandan area. In 2016, the organization provided 36,341 nights of shelter, 63,094 meals through its nutrition services and 23,166 pounds of food through its food pantry. Presenting the $5,000 grant on behalf of the SpartanNash Foundation were Dan’s Supermarket Store Directors Pete Bauer, Loren Olson and Neil Heidt. SpartanNash is the parent company of Dan’s Supermarket, with the SpartanNash Foundation serving as the company’s charitable giving arm. The Foundation was created in 2015 to support community nonprofit organizations that provide hunger relief, secure shelter and support our military heroes. For more information on the Foundation, visit spartannash.com/corp-responsibility. The SpartanNash Foundation was formed in 2015 following the merger of the Nash Finch Company and Spartan Stores. It represents the best of the NFC Foundation and the Spartan Stores Foundation. The SpartanNash Foundation is the charitable giving arm of SpartanNash and is focused on providing grants to nonprofit community partners who are working to end hunger, provide shelter and support our military heroes. To learn more about the SpartanNash Foundation, visit spartannash.com/corp-responsibility/foundation/. SpartanNash (Nasdaq: SPTN) is a Fortune 400 company whose core businesses include distributing grocery products to independent grocery retailers, national accounts, its corporate-owned retail stores and U.S. military commissaries. SpartanNash serves customer locations in 47 states and the District of Columbia, Europe, Cuba, Puerto Rico, Bahrain and Egypt. SpartanNash currently operates 154 supermarkets, primarily under the banners of Family Fare Supermarkets, Family Fresh Market, D&W Fresh Market and SunMart. Through its MDV military division, SpartanNash is the leading distributor of grocery products to military commissaries in the United States.